Activists picketed in front of Hillary Clinton's Brooklyn campaign office last week to show their support for more than 100 detainees from Bangladesh, Pakistan, Nepal, and Africa, conducting hunger strikes at several detention centers across the country. 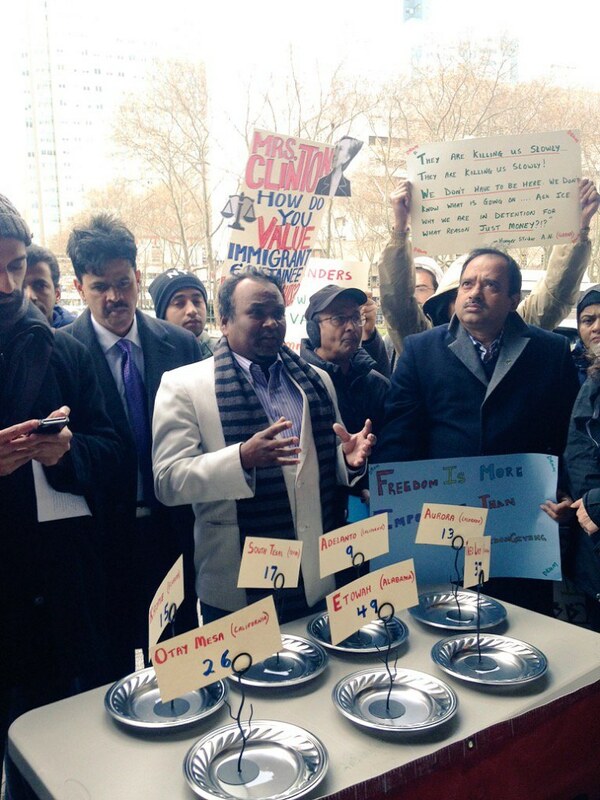 The movement, being called the #Freedomgiving Hunger Strikes, began over the Thanksgiving holiday and have been joined since then by detainees at additional centers in Colorado and Texas, according to DRUM — South Asian Organizing Center, a South Asian immigrant rights organization in New York City working with the detainees. Protesters last Thursday, Dec. 3, gathered at Clinton's headquarters to ask the presidential hopeful to speak out on the strikers' demands, and also look into the conditions of detention centers of the more than 150 people currently on hunger strike. Last Thursday following the protests aimed at Clinton, Democratic presidential candidates Sen. Bernie Sanders and former Maryland Gov. Martin O'Malley issued statements of support for the #Freedomgiving hunger strikers. More than a dozen advocacy groups, including Asian Americans Advancing Justice - Los Angeles, the Council on American-Islamic Relations, the National Immigrant Justice Center, and South Asian Americans Leading Together, sent a letter last month to the Department of Homeland security expressing their concern over how the parole rights of Bangladeshi political asylum seekers were being handled at detention centers across the U.S.